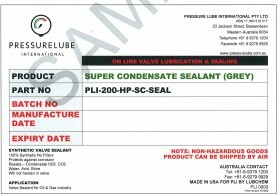 PLI SUPER CONDENSATE VALVE SEALANT (GREY) is a last line of defence in valve maintenance, i.e. a valve must be sealed at all costs to eliminate the need for an untimely shut down. Our valve sealant contains no PTFE-fillers, will not harden and is excellent for emergency seat renewal and low pressure sealing problems. It is designed for H²S and CO² service and is immiscible in condensate. This elevates the problem of valves becoming seized or stiff to cycle in condensate service, and improves valves integrity to seal online.